Recently, a trip to the cinema brought me to a realization. Comic books have a vast cultural impact these days, as evidenced through the trend worldwide behind Spidey-mania, and more recently, with Fantastic Four. And yet, there is a prevailing notion among the majority of people that comic books are delinquent at worst or lowbrow at best. The fact that there was such a dichotomy in the way people view comic books struck me as highly curious, and started me delving into its culture. My interest led me to look for materials dealing with this culture, and through that search, to this book. The title of the book is a highly significative one. It suggests that the culture in America is highly connected to the comic book movement and industry. 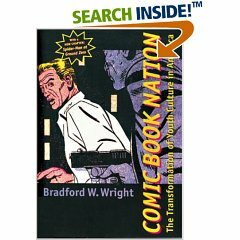 To this end, the author has divided the book into several chapters that were based on various comic book epochs, from its birth during the Great Depression (1933) to the more recent 1990s. Interestingly, most of these epochs have a strikingly close relationship to events in American history. Wright showcases comic books as a potent force in cultural imagination. In the first chapter of the book, he shows us how comic books gave voice to the common man throughout the era of Depression. Elsewhere, such as in the chapter dealing with the years of World War II, he demonstrates the huge role comic books played in raising patriotism through propaganda. However, he does not shirk from controversy, discussing difficult issues in chapters such as “Youth Crisis” and “Turning Point”. Throughout the book, he remains balanced in his handling of issues such as censorship, racial, and gender concerns. Unfortunately, the author regards the culture of comic books as a distinctively American one, and as such, has chosen to place his focus highly on American culture. This means that European comics such as Asterix or Tintin, and Japanese manga as well as their impact on the culture of their respective countries are not discussed. This drawback is not so much an indication of the quality of the book, but rather a matter of the author’s focus of attention. Despite this, the book still remains a highly entertaining and informative one. I would highly recommend this book, as it is a highly seminal one, and contributed greatly to my learning of comic book culture and history.